Update April 11, 2017: After yesterday’s report that BioWare Austin were prototyping a new KotOR game, Liam Robertson has downplayed some of his comments a little. As I said at the end of yesterday’s post, prototypes often never get past the prototype stage, and this may well be the case for the KotOR project. However, Robertson is confident BioWare are making something Star Wars regardless. Check our list of the best old games for more of the classics. 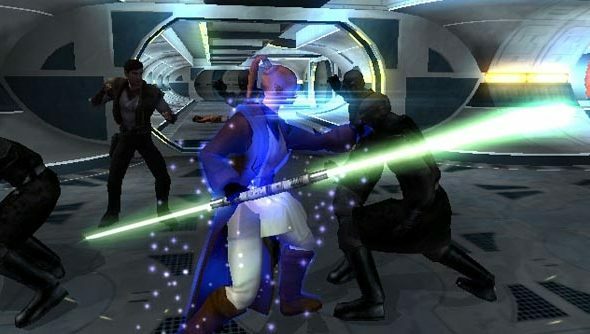 Kotaku‘s Jason Schreier agrees that KotOR was being prototyped, but“it hasn’t been greenlit and is not currently in development.” Instead, he says BioWare are focused on new IP. “Let me clarify that I don’t think KotOR’s a current project,” added Robertson. “From the same people I learned about [rumoured new IP] Dylan from, I did hear that they prototyped a KotOR revival at Austin a while back. Original Story April 10, 2017: There’s a new Star Wars: Knights of the Old Republic in the works, according to a prominent industry leaker. Whether it’s entirely new or some kind of remaster of the original is up for debate, but BioWare have apparently been prototyping it for a while. The news was reported via Liam Robertson’s excellent Patreon page, in which he uncovers details on abandoned and upcoming videogames. In a Patreon exclusive podcast, via NeoGAF, Robertson reveals that BioWare Austin are now focused on creating Star Wars games. However, the state of the game isn’t known. It’s unclear if the scope has expanded or not. Robertson has previous on leaks like this. He was the first to break the news of Scalebound’s cancellation, for example. Bad news. I'm hearing that @Scalebound is in trouble, possibly cancelled. Just rumours for now, but we'll see. Elsewhere, Robertson also broke the news of Middle-earth: Shadow of War‘s announcement before anywhere else. In other words, I’d be inclined to believe the guy. Still, these rumours are unconfirmed, so try to contain your excitement a bit. Not only that, but many games never make it past the prototyping stage, as Robertson’s series on cancelled games can attest to.